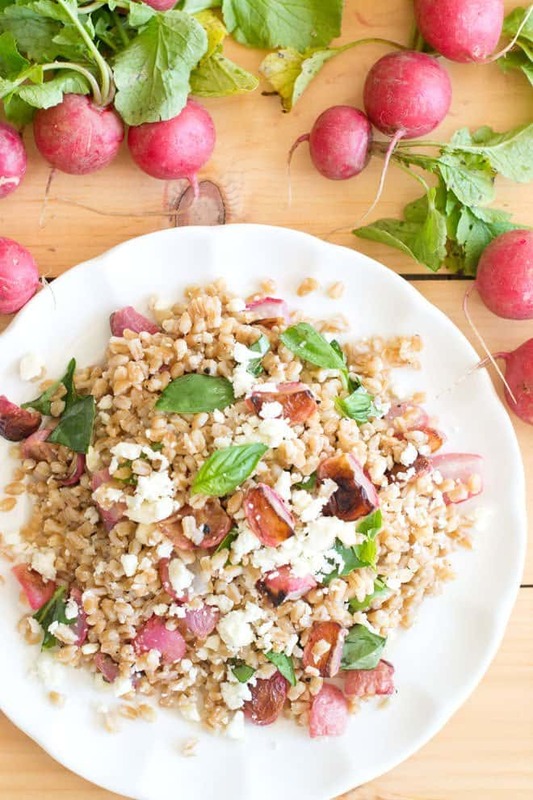 Learn how to roast radishes and how delicious they are in a salad like this one with farro, feta and basil. This post is sponsored by the International Association of Culinary Professionals. Awhile back I posted an article about how to roast radishes. I was addicted to them back then and made them weekly. Then I forgot about them for some reason. Recently though, I was at the International Association of Culinary Professionals annual conference and they were joyously thrust into my mind. It was pretty cool actually. During breakfast one day, I was sitting there eating and sipping my coffee when suddenly I realized that two women from thekitchn.com, like my favorite website in the world, were on stage talking. They weren’t just talking about anything though. They were talking about the biggest food trends that they’d noticed recently. I got out my pen and started making notes. How surprised was I though when one of the things they mentioned was roasted radishes. See…look here…I posted a bunch of their picks on instagram and roasted radishes is there on the bottom. That reminder about roasted radishes got me making them all over again. It also inspired me to try adding them to different things, like today’s farro salad. (I’m a bit obsessed with farro these days. See here). 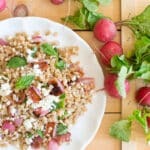 It has lemon juice, olive oil, the farro and roasted radishes, as well as feta cheese and basil. It’s a delicious way to use those roasted radishes, for sure. Before I share the recipe, I wanted to tell you a bit more about the IACP conference that I attended. I’ve attended a lot of conferences over the years, mostly blogging conferences. This one was a bit different because it wasn’t targeted at bloggers as much as it was targeted at food media professionals more generally, including cookbook authors, photographers, writers and any food professionals who work with social media in various ways. It was really interesting to attend different talks than the ones I’m used to at blogging conferences. I also really enjoyed meeting people from all areas of the industry. For instance, I spoke with a few different people about their biggest challenge in the industry. Here’s one answer that feels very familiar to me! Test Kitchen Dietitian Nancy Macklin shares her biggest industry challenge #teamIACP #iacp16. It’s one I think we ALL share, for sure. Really, I kind of loved it. I’m definitely thinking about going again in March when it will be in Louisville, Kentucky. I know it’s going to be a worthwhile learning experience and an overall great time. OK, now back to that radish recipe. Mmmm roasted radishes. Gotta have ’em. I know. 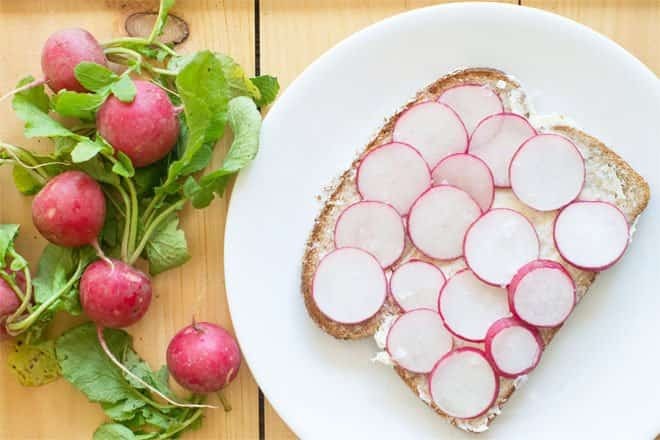 Put the radishes in a 9x13" cake pan and toss with 1 tablespoon of the oil and 1/4 teaspoon of the salt. 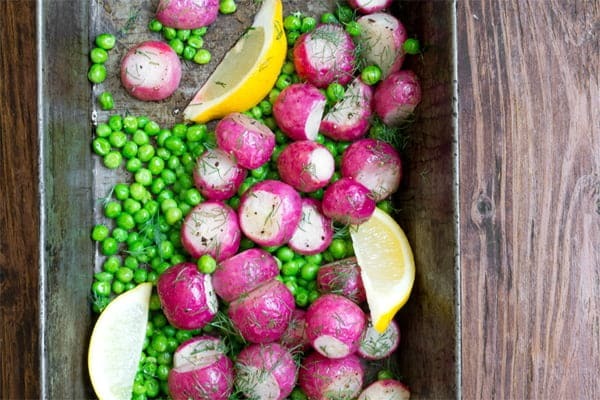 Roast until undersides are browned and radishes are tender, 20-25 minutes. Remove from oven and allow to cool. 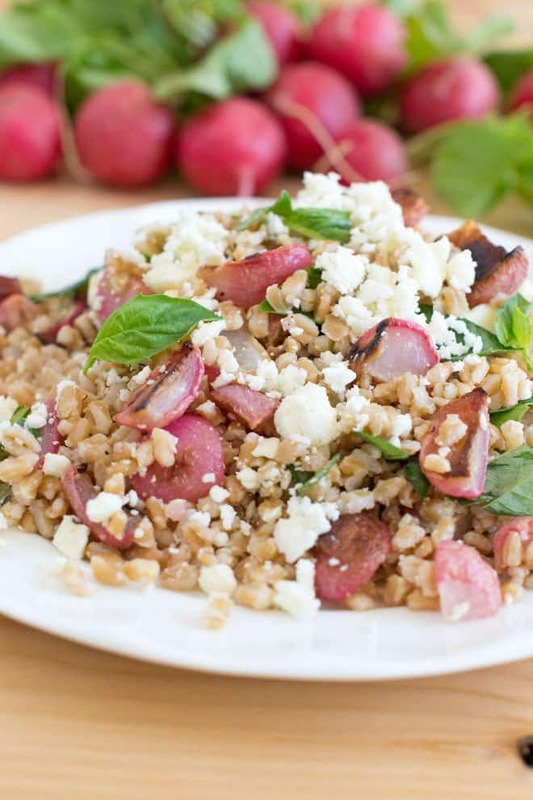 In a medium bowl combine the radishes with the farro, lemon juice, 1/2 teaspoon of salt and black pepper. Top with feta and tear basil leaves over top. Disclosure: The IACP paid for my conference ticket in exchange for me writing a post about the conference and sharing about it on social media. All opinions are honest and mine.